The 3-Bin system at Oakland Tech is a BIG project, and it takes all parties together to make is a successful implementation. Interns welcomed 5 custodians into their meeting to invite them to join their team as they continue to take steps forward to get the 3-Bins in place in all Oakland Tech classrooms. The job of a custodian is not an easy one, so interns set out to learn more about it and lend a helping hand for the day to get their daily tasks done. Custodial Staff lead the way as they dispersed around the school to complete their clean up routes, each custodian got the help from 4-5 interns. Together, interns and staff FLEW through their routes, and after joined us for an interactive educational activity and discussion. 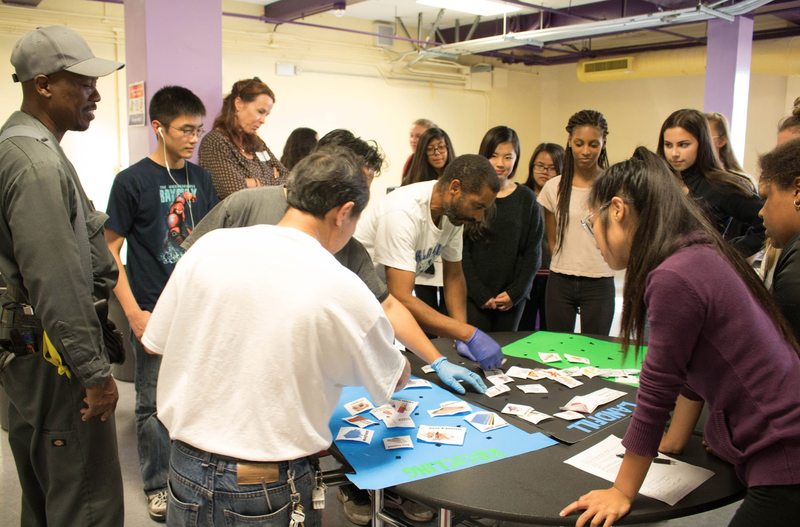 Interns led the 3-Bin system sorting activity educating custodial staff on how to properly sort common trash items at Oakland Tech. Interns also shared the importance of recycling, composting and the negative effects that landfills can have on our environment. This knowledge will be the driver in the success of this project, and interns aren’t stopping here, the whole school must know! To close the meeting off, interns facilitated a discussion with Custodial Staff. The role of the interns will be to represent the custodians, teachers, staff, and peers. Interns and Custodial Staff are eager to continue this project, and empowered finding out they are one of the first big high schools in the Oakland School District that will have a 3-Bin System in all classrooms! Thank you for reading! Keep a look out for next weeks blog as interns complete their last set of pre-project data with a school wide waste audit!